Sif is counted among the Æsir, and is attested to in the Poetic Edda, Prose Edda, and in Skaldic poetry. Her sphere of influence has some overlap with her sister-in-law, Frigga, however she stands on her own as one the Asyjnur, the major goddesses of Ásgard. She is rather iconic, usually depicted as having sublimely beautiful, long golden hair. Her name means “related by marriage” and she is the wife of Thor. 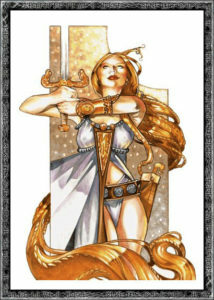 Sif is the mother of Trude, one of the Valkyries, with Thor. She is a goddess of the harvest and the Autumn – her hair the farm fields of golden wheat, and the bright leaves which fall. As autumn turns to winter, so to is she the mother of Ullr, a god of Winter. Her hair seems to represent vitality, and is counted as one of the great treasures of the gods, as important in its own way as her husbands powerful hammer, Mjölnir. The most famous tale about her features her hair, in which the trickster god, Loki, with whom she may have had an affair with, shaves her head and absconds with her hair. Throughout the stories, Loki is often a jealous god. Although he himself is described as comely and charismatic, he is envious of gods who are beautiful and well-liked. While asleep, and by some accounts having drugged Sif and Thor, he creeps into their bedchamber and shears off her crowning glory. The act was a violation and an outrage, and Loki was almost killed for it. He scarcely evaded this fate by gifting the goddess with an even better replacement, through wheeling and dealings with two clans of dwarfs. To sweeten the deal, Loki throws in five more magic wonders, establishing the six treasures of the gods: Sif’s golden wig, Mjölnir, Skíðblaðnir, Gungnir, Gullinbursti, and Draupnir. Sif’s wig was made by the dwarves from strands of actual gold, which sparkled and shone more brilliantly than before, and flowed like water. The hair piece made her more beautiful than ever, and similar to Draupnir, the wig multiplies itself and grows strands of hair-like gold all on it’s own, just like it was Sif’s real hair. In a later story, Lokesanna, Sif plays the role of peace-keeper. In the story, Loki insults all of the gods during a great feast. Sif attempt to shift the conversation, quieting Loki and restore a sense of civility to the gathering. This action, along with her name, has denoted her as a goddess of peace-keeping and social civility. Sif’s hair is thought to represent golden grain crops, ready for harvest, and as mentioned above, the golden leaves of the Fall seasons. She is envisioned as the embodiment of the crops reaching upward to her sky-god husband, Thor, who’s summer storms reach down and fertilize her. One of the kennings for the mineral gold is “Sif’s hair.” The story of her her hair cutting, and ever-regrowing wig is representative of the cycle of cutting down and regrowing crops and greenery of the trees. Sif is worshiped as the goddess of the harvest, of bread, and food for the family, as well as of family gatherings and provision. To the proto-heathens, family was everything, and had a much broader definition than today – the nuclear family being a contraption of 20th Century post-industrial society. Grandparents, aunts, uncles, cousins, cousins-by-marriage, god parents, step parents, step siblings, half siblings, in-laws, fosterlings, adopted family, as well as clan and tribe: Sif is the goddess of them all as a family unit. In a society of inter-generational feuding, the ties that bind a clan meant life and death. In the post-modern age, where family units break down, a goddess such as Sif may seem secondary, but in Viking times and earlier, Sif was a goddess of breaking bread together, and the ties that helped a clan survive. Sif is thought to have inspired Hrodgar’s wife, the character Wealhbeow in Beowulf. She is similarly golden-crowned, and defuses all conflict in her husband’s hall. Comparative mythology sometimes connects Sif with the Greco-Roman goddess of golden grain and family feasting, Demeter, also known as Ceres. Like Sif, Demeter loses her golden-ness, shrouding her hair and divinity when she is violated, with the taking of her lovely daughter, Persephone. Sif is known to the Saami people by the name Ravdna, the goddess of the rowan tree. In Norse myth, a kenning for the rowan is “the saviour of Thor”, as the god clung to it in myth, saving himself from drowning. This tree is thought to be an avatar of Sif in the story, and she is likened to the rowan, as it is she who mighty Thor clings to. Golden hair, wigs, weaves, hair pieces, combs. Cosmetics and beauty treatments. Harvests, wheat and grains, bread, fields and meadows. Autumn leaves and harvest seasonal motifs. Families: extended, split and in-laws. Rowan trees. The expression “breaking bread.” Gold. The rune Ár.